Our Italian Greyhound puppy collars are stylish, look smart and at the same time are practical enough to be worn everyday. 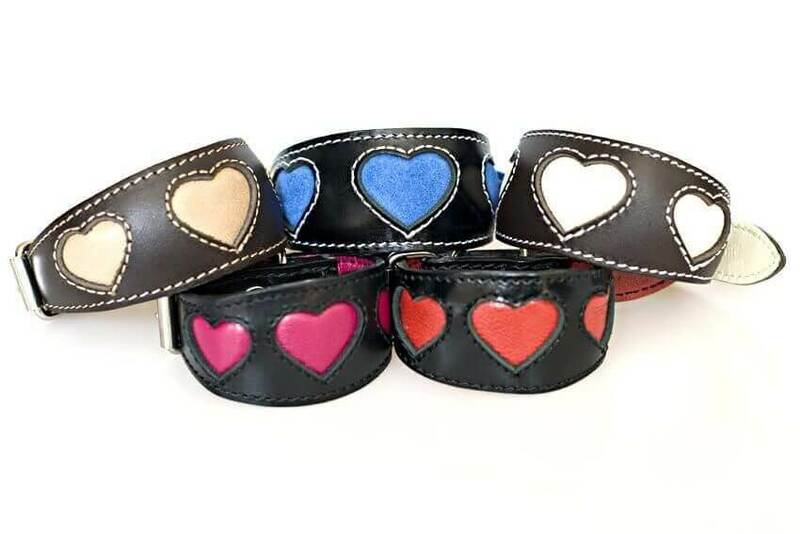 These are the softest leather collars for Italian Greyhound puppies with three hearts and soft leather lining. You have a choice of red, beige, pink, cream, blue or turquoise hearts. The most popular Italian Greyhound puppy collars designed for the IG of you life! These Italian Greyhound puppy collars are generously padded and fully lined with soft goat skin leather for your IG puppy's ultimate comfort. XXS size introduced specifically to create collars for Italian Greyhound puppies. Apart from 'special collars for special dogs' argument, Italian Greyhound puppies need wider dog collars resembling fishtail shape because with them having such slender necks a normal dog collar could easily damage their delicate necks when they pull. As a result our Italian Greyhound puppy collars are soft and padded, but most importantly are wide, so that collars do not put a lot of pressure on one small area of Italian Greyhound puppy's fragile neck. Therefore, IG puppies should not be on an ordinary narrow flat collars, as their necks are prone to injury due to its size and shape. Moreover, due to the shape of Italian Greyhound's head, you would find that a lot of puppies can slip out of a normal narrow collars. Our Italian Greyhound puppy collar sizes are given as neck measurements, not the total length of the collar. The neck size given is the distance from the buckle (A) to the first (B) and the last (C) hole. Tiny XXS size of our very popular Italian Greyhound collar was introduced specifically to create collars for Italian Greyhound puppies. 18 - 22 cm (7" - 8.5"), 3.5 cm wide collar for Italian Greyhound puppies. Please do not hesitate to call +44 (0) 20 3582 4532 or contact us if you need help in choosing the correct size collar for your Italian Greyhound puppy. We are here to help! Thank you so much for sending the IG puppy collar so quickly, it is absolutely lovely! Looks great and so nicely padded. We have had some really nice comments about this pupy collar. Not just Italian Greyhound lovers but all sorts of people on our walks. I’ve had this red hearts Italian Greyhound puppy collar for over 5 months now and I’m so pleased with the quality. Thank you very much! I just love these tiny Italian Greyhound puppy collars!!! They are awesome! Very pleased with this leather puppy collar for my Italian Greyhound. Nicely made of very soft real leather. Love it! These red hearts IG puppy collars are very comfortable and fabulous looking! Good size as well. I have had three collars from Dog Moda. I always buy the pink hearts collar, it is very good quality leather and looks lovely on my dog. I've always had lots of comments about it. I would recommend Dog Moda for the good quality IG puppy collars and excellent service. Collars always arrive the next day after ordering. Thank you so much for my lovely Italian Greyhound puppy collar and lead. Many thanks! Thank you for your customer service. I love this red hearts Italian Greyhound collar I have just bought for my dog. I bought her the same IG puppy collar 6 years ago and it's lasted that long! It gets complimented a lot! Please pass on my compliments. I received this lovely collar today - can I just say, "Wow!" That was remarkably efficient. Thank you very much.